While there may be a vested interest, engineer Keith Hewett does make a good point when he emphasises the role an acoustician can play in achieving optimal sound performance for a project. The key for Hewett, who is lead acoustician of Australian engineering firm TTM, is that acoustic strategy be incorporated into the design from the outset to optimise performance and to avoid resorting to costly and unattractive band-aid solutions after project completion. “It’s not impossible to solve noise issues retrospectively, but your options become more limited and expensive, and it can impact on the integrity of the original design,” says Hewitt. Hewitt is also a firm believer in the acoustician working hand in hand with architects to achieve the right outcome for the space, which, he says, isn’t always about reducing noise. So we put it to Hewett. We asked him to give us a variety of examples where an acoustician has worked with an architect to achieve a sound acoustic outcome, overcoming many challenges that architects commonly face in the process. The client was experiencing noise build-up in a break-out area outside meeting/training rooms, which was then being transferred into an open plan work space causing disturbance to people working. Also a meeting room adjacent to reception was suffering from noise build-up for the occupants during meetings and particularly teleconferences making the room uncomfortable to be in coupled with poor speech intelligibility during teleconferences, where noise gets picked up by the microphone and is transferred to the other end of the call. This then gets picked up in a feedback loop between the various locations causing additional noise build-up and poor intelligibility. In addition, noise from the meeting room was breaking out into the reception area resulting in disturbance to others and poor speech privacy for any confidential information being divulged in the meeting room. Noise was also breaking in and intruding on the occupants of the meeting room. The breakout area and open plan office had an open soffit to meet sustainability (Green Star) targets and architectural intent. This allows noise to be reflected efficiently off the ceiling to other areas. Pivot glass doors were used for architectural design to the training rooms that opened out to the breakout area. Pivot door are inherently difficult to seal due to the lack of a frame to close on to and gaps around the perimeter. This lets noise leak out of the rooms unabated. Glass rooms, glass façade, open soffit ceiling and thin pile floor covering meant that virtually no absorbing surfaces are available to prevent noise build-up and specular reflection to other areas. In the Meeting /teleconference room a tiled floor, open soffit, glass façade, glass wall and door to reception and lunch space, and timber panel wall meant a highly reverberant space. Pivot double doors to reception with visible gaps around the perimeter and meeting stile also meant an open conduit for noise transfer between spaces. It is very difficult to improve the performance of pivot doors as they have no frame and therefore it is inherently difficult to provide an effective seal. We did however, recommend brush seals (Raven RP2a for the threshold with an RP82 threshold plate and PR74 for the top of the door where it meets the ceiling) around the perimeter of the doors, where there were none previously. These are expected to provide a slight improvement, but short of replacing the doors there is little more that can be done. Armstrong’s Soundscape vertically hanging baffles were recommended to be arranged along the open ceiling soffit, because they hit several birds with one stone. First of all, they introduce much needed absorption into the space and because they are vertically hanging they provide double the amount of effective absorption area because sound can see both sides of the baffle, rather than just one if they were horizontally mounted on the soffit and by hanging vertically they also breakup specular reflections off the ceiling soffit which is the cause of noise travelling large distances across the office. Another architectural benefit is that the client liked the look and that they came in many colours and they still leave the soffit largely open to provide the thermal mass required for meeting sustainability targets. A similar approach was used on the meeting/teleconference room. The same acoustic baffles were recommended for the soffit. However, more absorption was still required to make it suitable for a meeting room and in particular for teleconferences. A 600grams per sqm (gsm) Velour theatre type curtain was recommended to be installed along the glass wall that faced the lunch area. This would help break up reflections and provide visual privacy for occupants of the meeting room. In addition, this can be pulled back when desired for a different acoustic or visual purposes. Additional acoustic absorption was recommended for the underside of a plasterboard bulkhead over the pivot doors. This would provide absorption close to the meeting room occupant and break up a cue-ball effect specular reflection that the geometry presented. The products recommended here could be anything from Supawood perforated ply panels or a low flow resistance fabric covered panel with 50mm Tontine Acoustisorb 2 behind. Alternatively, they could use Sound Sorba’s Cloudsorba product. This facility was designed to cater specifically to the needs of its local community, and includes an integrated local library, community centre and child care centre. The combination of services under one roof presented a number of challenges – most significantly the acoustic conflict of merging traditionally quite library spaces, with the high-energy and noise levels of child care and community engagement facilities. The contrasting nature of the combined spaces meant a unique acoustic design approach was required for each zone. 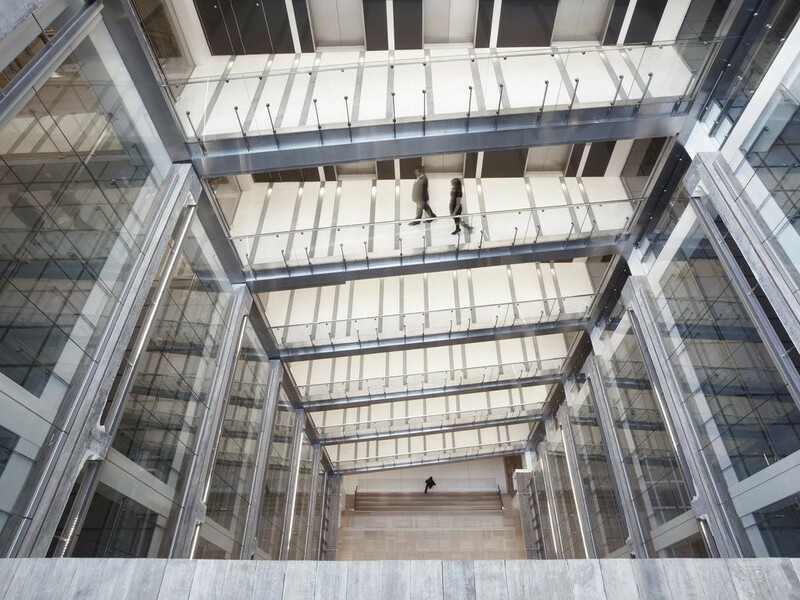 The architecture also incorporated a number of modern design features, including glass, atriums and sharp lines and surfaces – that provide poor acoustic performance. Interestingly, the library spaces were designed purposefully using sharp lines and hard surfaces that reflect and amplify sound to encourage users to keep quite. The inherent high-energy and high-noise of both the childcare and community centre zones require acoustic absorption to allow users to engage and interact without excessive noise carrying into the library. To achieve this, the architects used pre-finished, fire-rated, perforated acoustic panels (Décor Zen and Décor Style– by Décor Systems) extensively throughout these spaces, achieving up to 88 per cent of incidental noise absorption. Maintain heritage features of 1920’s building whilst meeting acoustic Green Star points for Australia’s first 6-star Green Star Heritage office fitout. To maintain heritage features meant retaining the period ceiling detailing, which included, open plastered ceiling with intricate cornices. As the ceiling is the major reflective plane in an office, it is the most desirable and effective place to locate acoustic treatment to control reverberance to meet Green Star reverberation Time Targets. No construction element or services were allowed to be directly fixed to the ceiling. The design team including building services, acoustics, lighting, fire and the architect came up with the idea of fixing all the required services and acoustic absorptive treatment into a bespoke ‘Lilly Pad’ designed floating panel minimally suspended from the ceiling. This was the only way to meet the brief and maintain the heritage features whilst meeting all the available Green Star credit points. The central spine of the panel and perimeter consisted of highly absorbent acoustic treatment. It was important that the material was highly absorbent since there was limited area in which to locate it. Secondly, it needed to be rigid to some degree to avoid it sagging and spoiling the architectural aesthetic. Therefore, we specified a product similar to Fletcher Insulation FI96 HDEI. The glass wool sheet was a very high mass of 96kg/sqm, which gave it it’s stiffness and high absorption coefficient. The brief was achieved and acoustic Green Star credits achieved along with Australia’s first heritage refurbishment 6 Star Green Star rating. The cutting-edge “Light” Neville Street installation was designed to reduce noise, enhance lighting, and improve safety and security in the tunnel. As part of the artistic “light and sound” installation created by German artist Hans Peter Kuhn, there was an eerie combination of whirrs, clattering, grinding noises and other "sounds of the city", missed with urban music. This was pivotal to the installation, and had to be amplified over the traffic noise. The installation also featured thousands of LED lights installed in the walls, that formed patterns as drivers and pedestrians pass through. The challenge was finding a material that could balance the complementing noises. The traffic noise had to be softened, rather than eliminated, to match the ambient sound installation. Acoustic panels made from recycled glass (Quietstone Light) were installed behind perforated metal wall panels. The easy-to-install panels offered high sound absorption that helped control ambient noise levels, thereby enhancing the acoustics of the audio installation. From an artistic perspective, it was also important that the walls had a contemporary aesthetic that complimented the lighting scheme. The wall surface was comprised of a graffiti-resistant anodised aluminium, that incorporated the mass of LEDs, improving the level of light throughout the tunnel whilst reducing glare for drivers.